As the need for protective packaging of the beverage products during transportation arises, manufacturers are shifting their focus on developing smart packaging solutions. Surge in demand for the packaging solutions that accommodate branding features and more storage space has led to an upsurge in demand for advanced beverage packaging solutions. Growing requirement for packaging cream, juices, milk, wine, yoghurt, edible oil and egg yolk will continue to fuel sales of gable top liquid carton globally. Imposition of regulations by the governing authorities regarding eco-friendly production of packages will further contribute towards growth of the global gable top liquid cartons market. 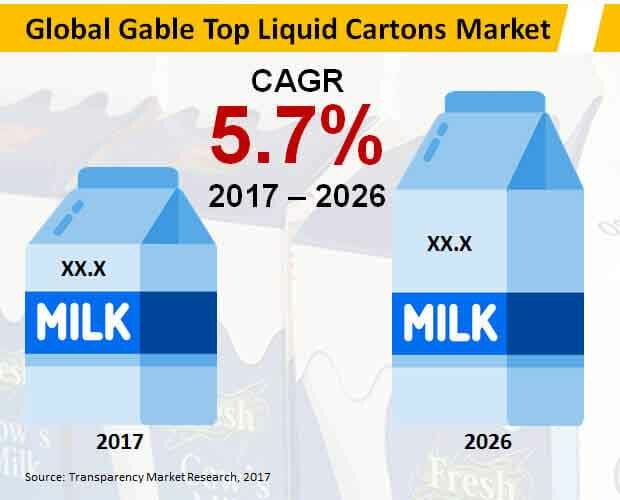 According to Transparency Market Research, the global gable top liquid cartons market is expected to represent a value of over US$ 5,300 Mn by the end of 2026. Growing need to prevent the beverage products from environmental contamination has led the manufacturers to opt for smart packaging techniques that offer features such as high barrier, low contamination, lightweight and aseptic features. In order to offer smart packaging solutions, manufacturers are focusing on adoption of nanotechnology to develop packaging solutions for temperature sensitive beverage products. As the need for packaging in the pharmaceutical industry arises, manufacturers are incorporating intelligent packaging solutions to ensure stability in the quality of the packaged products. Increasing demand for moisture control packaging has further led the manufacturers to adopt advanced printing technology that allows flexographic and commercially premium quality designs. These factors are expected to impact growth of the global gable top liquid cartons market positively during the forecast period. Regulations imposed by the government are increasingly seeking to influence the direction of packaging industry towards matching up with the environmental recycling objectives. Governing authorities in various countries are increasingly imposing regulations regarding production of the eco-friendly packages, which has led the manufacturers to shift their focus on developing biodegradable packaging solutions. As the paperboard cartons are composed of premium quality long fiber, manufacturers are shifting their focus towards adoption of the paperboard material for developing eco-friendly and biodegradable packaging solutions. Unlike the plastic bottles, the paperboard products have a comparatively longer shelf-life. Attributed to these factors, the global gable top liquid cartons market is expected to witness robust growth during the forecast period. Manufacturers are increasingly focusing on developing fully-renewable beverage carton packages and innovating products to introduce enhanced packaging solutions. Through implementation of these strategies, major market players are focusing on gaining a competitive edge among the other market players globally. These factors are expected to impact growth of the global gable top liquid cartons market positively. As the need for protective beverage packages that allows minimal spillage arises, demand for the straw hole opening cartons continue to increase. On the basis of product type, the straw hole opening cartons segment is expected to represents a significant, accounting for a value of nearly US$ 500 Mn by the end of 2026. In contrary, the king twist opening cartons product type segment is expected to register a significant CAGR throughout the forecast period. Based on material type, the uncoated paperboard segment is expected to generate significant revenues, recording for a value of over US$ 700 Mn by the end of 2017. However, the aluminum coated paperboard material type is expected to register a robust CAGR through 2026. Leading market players operating in the global gable top liquid cartons market include Tetra Pak International S.A., NIPPON PAPER INDUSTRIES CO., LTD., Evergreen Packaging Inc, Elopak Inc, ITALPACK CARTONS SRL, American Carton Company, Sonderen Packaging, SIG Combibloc GmbH, TidePak Aseptic Packaging Material Co.Ltd, Adam Pack sa and Parksons Packaging Ltd.